A husband and wife carried out a suicide attack that killed eight people at a police station in north-western Pakistan, the Taliban has said. The attack took place late on Saturday in Kolachi, near the tribal region and Taliban stronghold of South Waziristan. The pair entered the police station dressed in burkas, hiding rifles, hand grenades and suicide vests underneath. They held staff hostage for several hours before detonating themselves, killing seven officers and a tea boy. The pair pretended that they had a complaint to make when they initially entered the station before removing their burkas and launching an assault. The BBC's Orla Guerin, in Islamabad, says that the use of a husband and wife suicide squad by the Pakistani Taliban is a new tactic, and a new threat. Already, our correspondent adds, the militants have resorted to using children as human bombs. And a suicide attack in Pakistan's tribal areas last December was blamed on a woman bomber. A Pakistani Taliban spokesman said the attack was carried out in retaliation for the killing of Osama Bin Laden on 2 May by US special forces, and for Pakistani government attacks against militants. "The attackers were a husband and wife. We will keep carrying out attacks with different strategies," Ehsanullah Ehsan told Reuters. The country's Taliban movement, close to al-Qaeda, has increased the number of violent attack in Pakistan since the death of Bin Laden. 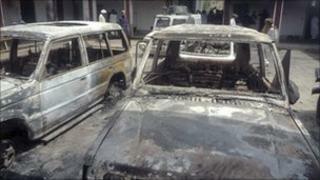 The group has also said it carried out a suicide bombing at a navy base near Karachi last month which killed dozens.